Making the choice between the filters above is quite easy. First, you need to know whether you have "city supplied (municipal)" water, or "well" water. If you have well water (a well below your house), then you should get the Jupiter Ionizer Protector™ Red-D Ultra Filter which is designed to remove up to 99.99% of submicron pathogens, bacteria, viruses and cysts. 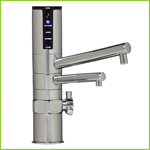 But, if you have city water that is full of treatment chemicals (like chlorine, chloramines, etc) then you want to be sure to get the new Jupiter Ionizer Biostone Select™ Filter, which removes most water treatment chemicals.